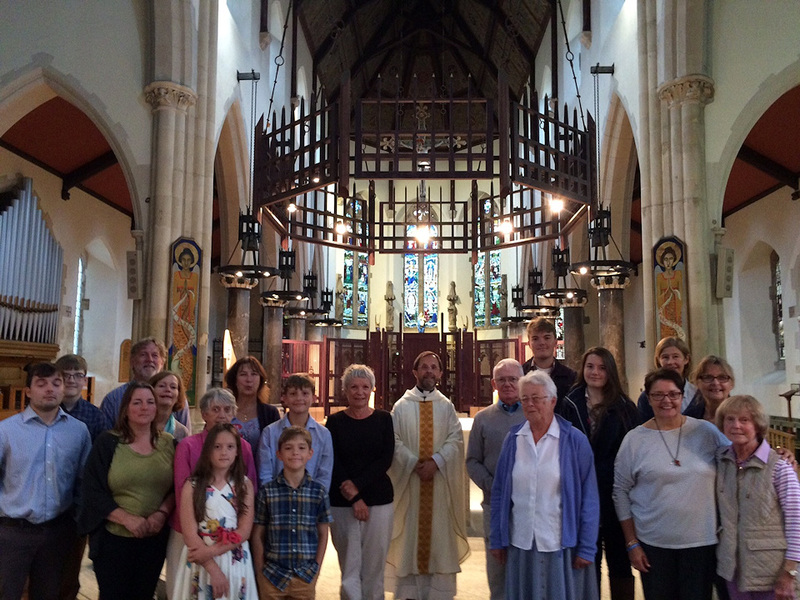 On Saturday 3rd September 2016, a group of 20 parishioners, led by Fr Louis, went on a pilgrimage to Plymouth Cathedral. The purpose of the pilgrimage was to mark in a very special way this Jubilee Year of Mercy. Pilgrimage is essentially an impetus to conversion. Our pilgrimage to the Cathedral contained three key elements: first, to cross the threshold of the specially designated Holy Door of the Cathedral and in so doing seeking to find strength to embrace God’s mercy and dedicate ourselves to being merciful to others; secondly, to walk the ‘Path of Mercy’ within the Cathedral, stopping to reflect and pray at a number of important ‘stations’ such as the Divine Mercy Shrine, the Blessed Sacrament Chapel, The Pieta, the Lady Chapel, the Sacred Heart Chapel; thirdly, concluding with Holy Mass. At the end of the pilgrimage, a number of us remained behind to eat a simple ‘pilgrims’ lunch in the Cathedral conference centre. We returned to our homes spiritually uplifted for having made this special pilgrimage and so experience more deeply the wonderful mercy of God. This experience was intensified on the following when, by a happy coincidence, Pope Francis canonised Blessed Teresa of Calcutta, a marvellous exemplar of God’s mercy, during which he referred to her as a generous dispenser of divine mercy in all aspects of her life. Pope Francis said that Saint Teresa of Calcutta had made herself available for everyone through her welcome and defence of human life, those unborn and those abandoned and discarded. She was committed to defending life, ceaselessly proclaiming that “the unborn are the weakest, the smallest, the most vulnerable”. She bowed down before those who were spent, left to die on the side of the road, seeing in them their God-given dignity. For Mother Teresa, mercy was the “salt” which gave flavour to her work, it was the “light” which shone in the darkness of the many who no longer had tears to shed for their poverty and suffering.